There's not much more important than local community and the building of that community. And that's why, here at Ribble FM YOUR Community Station, we reflect and enhance the local area, the towns and many villages which make up this unique place to live and work. Ribble FM operates a truly local and professional community radio station for the benefit of all. After months of hard work the dream was fully realised when after a year of being online and on smartphone apps we launched on FM in July 2016! 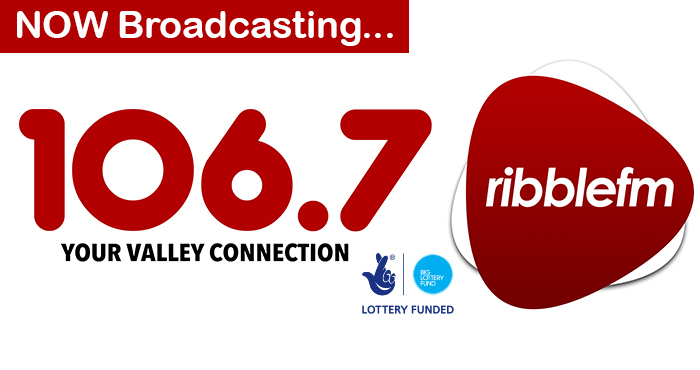 We are broadcasting 24/7 on 106.7 FM across the Ribble Valley as well as streaming online via our website and our own app which is available on iPhones and Android devices. We interviewed over 400 businesses, organisations, people, fundraisers, charities and other community groups in our first year, LIVE on air! We have been recognised for our achievements by winning numerous awards to become a multi-award-winning station. Clitheroe and the surrounding towns and villages have never had a dedicated local community or commercial radio station licensed by Ofcom dedicated to the Ribble Valley and now we have! We are working hard at Ribble FM to ensure the continued success, so that the community as a whole can be part of Ribble FM for many years to come. Kath Lord-Green - Founder & Executive Director, Lee Roe-Station Manager, John Houldsworth - Director & Ribble FM Solicitor, Steven Lancaster - Volunteer Trustee, James Evans - Director and Ribble FM Accountant, Joanne Carlin -Director and Jane Viljoen - Director.